Gallery 723 (Apr 10, 2019). Oh, guys and gals, that was a really unexpected adventure. More about that later. First of all you have to know that it was a quite cold day. The small mountain lake behind us even had ice floes. 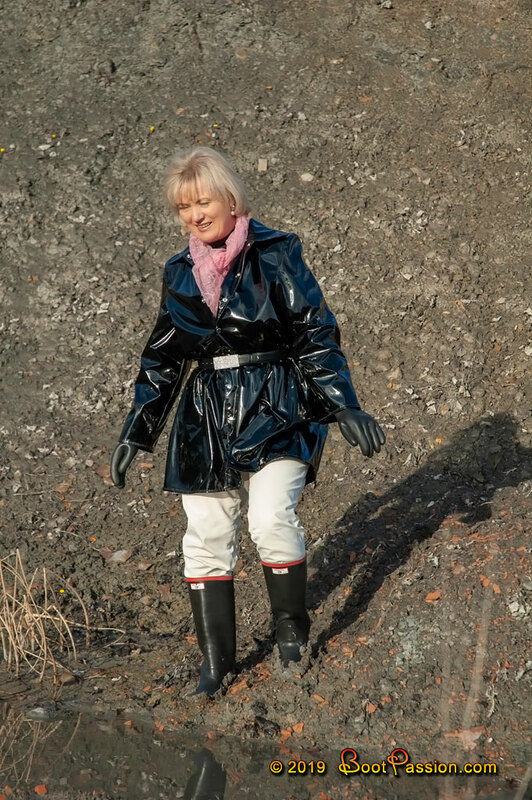 We had planned a gallery with these great Argyll Wellies in just as great mud. Because they are so robust (and also look that way), we thought they would go well with this barren and hilly clay pit. Dried clay is hard like concrete, but in wet conditions beautifully soft and creamy — though very sticky at times. As you can see, we not only found a nice spot, I even sunk far above the boot tops. And it should come even better. That is a story of its own, however, so that gallery will follow next week. Look forward and enjoy. (36 pictures and 6:26 min video in the members area).